Beaver Lake State Park provides an escape from the rigors of everyday life, offering a relaxing atmosphere in a secluded outdoor setting next to a quiet lake. 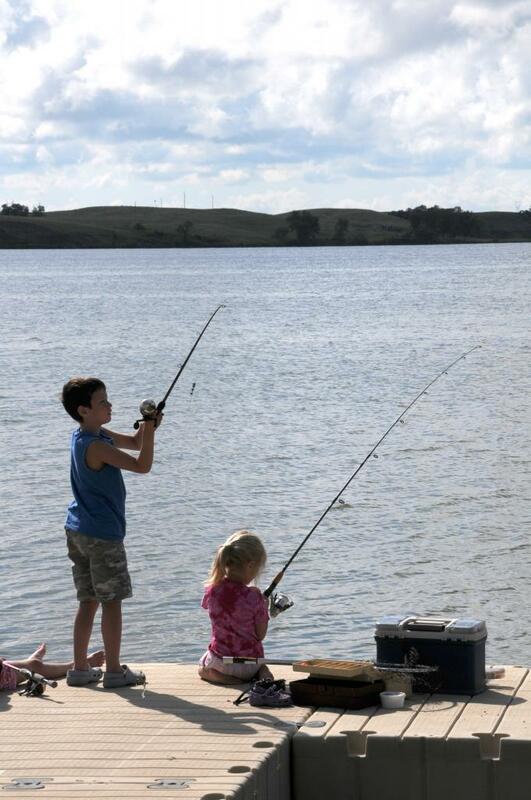 The lake is nestled among the gently rolling prairie that provides scenic views for leisurely walks. The park has a colorful and historic background relating to the early settlers of Logan, McIntosh, and Emmons counties. Park visitors can view a historic cairn that stands in the park as a testament to the efforts of those who helped establish the park. The park offers primitive and modern camping as well as three camping cabins for those wanting to get away from it all. Park guests will find plenty to occupy their time, whether it’s studying the area’s fascinating history; discovering the plentiful natural resources; taking advantage of refreshing water sports; hiking; mountain biking; fishing; or just relaxing in the shade of an American elm. Beaver Lake State Park is home to three seasonal camping cabins. The Hoberg, Homestead, and Pioneer cabin are all situated next to one another along the Lakes edge. The cabins are located near the primitive campsites right off the main campground loop. 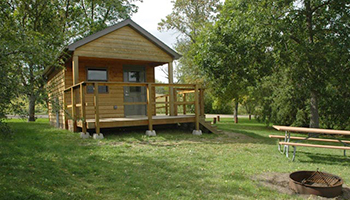 Looking for an economical getaway during the summer, our camping cabins are a great choice. Open seasonally, these cabins are air-conditioned and come with a small refrigerator and microwave. The cabins sleep five with one queen bed and 3 single beds, set up bunkbed style. All the cabins are handicap accessible. Beaver Lake has two small shelters. Each shelter includes six picnic tables and has electricity. Picnic shelters can be booked by calling the park at (701) 452-2752. 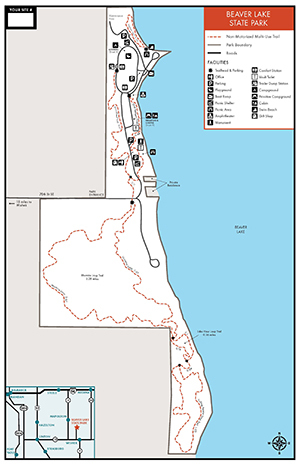 Beaver Lake State Park's non-motorized trail system covers 5.34 miles in a series of loops and several connecting segment trails that are open for hiking and biking. The Beaver Lake Nature Trail is a self-guided nature trail open to hiking only. Most of the trail system surface is either grass, dirt or hard-packed single-track, with manageable grades with only a few steeper sections. This self-guided interpretive trail begins and ends at the swimming area. The nature trails winds through woodlands, skirts the lake shoreline, and meanders through the rolling prairie. A trail guide is available that interprets area geology, wildlife, vegetation, and ecology. The trail guide is available at the trailhead, park headquarters, and the entrance station. It starts just south of the amphitheater and winds its way along the lake shoreline, passing the tent campground, park cabins, picnic area and shelters coming to an end just north of the park entrance. The trail provides scenic overlooks of the lake. The stone cairn bearing an inscription naming the park founders and park dedication date of July 24, 1932, can be seen from the trail. In addition, from the trail one can glimpse the old stone cabin, which was used by the park caretaker as a residence. A .67-mile trail starting south of the west campground comfort station. The biking-hiking trail meanders in and out of grasslands and woodland areas providing habitat for a variety of bird species. Common summer bird species to look for include kingbirds, meadowlarks, woodpeckers, chickadees, and yellow warblers. It starts at the entrance road looping through native prairie then meets the Lake View Trail at a signed junction. Hikers can easily see the shape of the landscape carved out by the glacier as they travel up and over the rocky moraine. The trail offers some excellent views of Beaver Lake and offers good bird and butterfly watching opportunities. The short .36 mile trail is located between the Moraine Loop and Rolling Prairie Loop in the southern portion of the park. Access can only be gained by traveling along the Morraine Loop. A short .09-mile trail segment provides a link from the Lake View Trail to the southernmost, secluded Rolling Prairie Loop Trail. The trail skirts sveral green ash-American elm woody draws that provide important food and cover for game and non-game species such as birds, beaver, raccoons, rabbits, deer and squirrels. This 1.02 -mile biking-hiking trail explores rolling prairie and wooded ravines in the most secluded area of the park. The scenic trail displays an array of prairie wildflowers and native grasses. Prairie wildflowers include Missouri goldenrod, scarlet gaura, silver scurfpea, vetch, white milkwort, yellow coneflower, and leadplant. Common prairie grasses include western wheatgrass, big bluestem, little bluestem, green needle grass, needle-and-thread grass, porcupine grass and prairie junegrass.